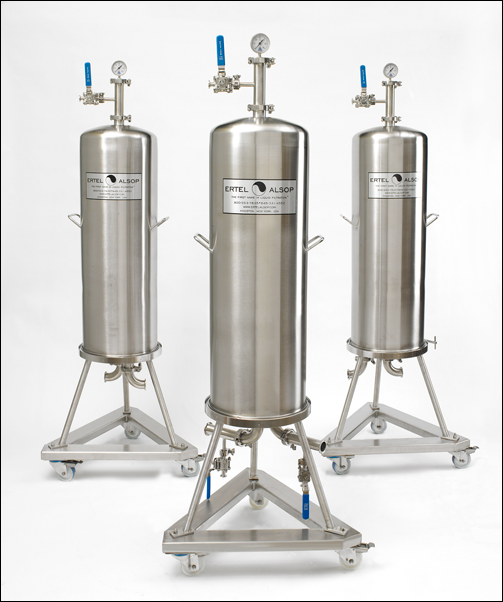 The filtration of pharmaceutical and biological fluids requires a complete understanding of the pharmaceutical filtration process, including both filter media and filter equipment. ErtelAlsop is the only US based manufacturer of a complete line of Pharmaceutical Filters, ranging from sanitary laboratory equipment to sanitary production equipment. We manufacture pharmaceutical grade filter paper , Micro-Cap™ Disposable Laboratory Capsules and double O-ring depth filter cartridges. Our cellulose based depth filter media provides a highly effective solution for clarifying or polishing pharmaceutical products such as syrups, Large Volume Parenterals (LVPs), Small Volume Parenterals (SVPs), Active Pharmaceutical Ingredients (APIs), as well as biological products such as blood plasma, blood fractions, animal sera, fermentation broths, cell culture media and veterinary products. Depth filters are also widely used as a pre-filter to final membrane filters. They are highly effective in minimizing the particulate challenge placed on the membrane, thereby providing ideal operating conditions to allow the membrane to realize its full potential. ErtelAlsop offers the widest variety of Pharmaceutical Filters and filter media available including 100% cellulose filter pads, cellulose/diatomaceous earth, cellulose/perlite, and cellulose/diatomaceous earth/activated carbon. Our pharmaceutical grade media is manufactured to the stringent controls of our Drug Master File located at CDER and is supported by The Validation Guide for ErtelAlsop Pharmaceutical Grade Depth Filters.